Who built the Arbeit Macht Frei gate at Dachau? This morning I was reading a travel blog written by a woman who had visited Dachau. She was curious about who had made the Arbeit Macht Frei sign that is on the gate into the camp. Comments Off on Who built the Arbeit Macht Frei gate at Dachau? 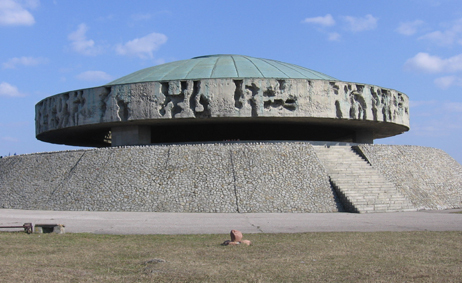 The photo below shows the Mausoleum at the Majdanek Memorial Site. 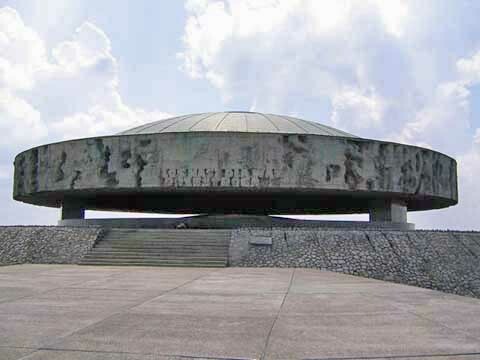 According to the Majdanek Museum guidebook, the ashes under the dome are the ashes of the victims who were shot on “bloody Wednesday,” the third of November, 1943. This was the largest mass execution carried out at any of the concentration camps in the history of the Holocaust. The victims were the last remnants of the Jewish population in the Lublin district, according to the Museum guidebook. According to the web site of the United States Holocaust Memorial Museum, on the occasion of the “Harvest Festival,” the SS and police killed about 42,000 Jews, which included the killing of between 11,000 and 16,000 Jews at Poniatowa and between 4,000 and 6,000 Jews at Trawniki. The USHMM says that Himmler ordered the implementation of Operation “Harvest Festival” because he feared more incidents of armed Jewish resistance after the prisoner uprising at the Sobibor killing center. I visited the Majdanek Memorial Site in October 1998 and purchased the official guidebook to the camp. According to the guidebook, Heinrich Himmler ordered the liquidation of the Jews in the Lublin district after the insurrection on October 14, 1943 at Sobibor, one of the Operation Reinhard extermination camps on the Polish-Russian border, in which 300 Jews, led by a Jewish Russian Prisoner of War, escaped into the nearby woods. At that time, the three largest concentrations of Jews in Eastern Poland were 1. the concentration camp at Majdanek, 2. the labor camp at Poniatowa, a tiny Polish village where 18,000 people were held, and 3. the Polish village of Trawniki where 10,000 Jews were imprisoned in a labor camp. The guidebook says that “In the autumn of 1943, the Nazi authorities were alarmed by the uprisings in the Warsaw and Bialystok ghettos, by the activity of the resistance movement in the camps and by the rebellions in the death camps at Sobibor and Treblinka.” According to the guidebook, the greatest fear of the Nazis was that the Jewish prisoners at Lublin would start a rebellion that would result in their escape to the forests where they would join the Polish partisans who were fighting the German Army. The guidebook explained that the Nazis also feared that their plan to exterminate the Jews was being thwarted by the cooperation of the camp resistance movement at Majdanek with the Polish underground organizations fighting as partisans outside the camp. The guidebook devotes a whole section to the activities of the camp resistance movement, which included activists from the Polish Home Army, and the main political parties: the Polish Socialist Party, the Peasant Party, the National Party, and the Polish Worker’s Party. Along with the Polish civilian partisans and the Jewish partisans hiding in the forests, there were also escaped Russian Prisoners of War, who would sometimes shoot the Jewish partisans. Although Poland had been conquered, within a month after the country was invaded, by the joint effort of the Germans and the Russians, guerrilla warfare continued in Poland until the Germans finally surrendered to the Allies in May 1945. According to a book entitled The forgotten Holocaust: the Poles under German Occupation, written by Richard Lucas, the Polish resistance fighters were responsible for 6,930 damaged train engines, 732 derailed trains, 979 destroyed train cars, 38 bridges blown up, 68 aircraft destroyed, 15 factories burned down, 4,623 military vehicles destroyed, 25,125 acts of sabotage and 5,733 attacks on German troops. Around 100 SS men were brought in from Auschwitz and other locations to do the shooting, according to the guidebook. In preparation for the mass execution, ditches were dug for the bodies behind the spot where the Mausoleum now stands, 50 meters away from the crematorium building. It took 300 prisoners, working two shifts day and night to dig three big ditches over 2 meters deep and 100 meters long, running in a zigzag line. These open ditches are still visible, although they look like they have been filled in somewhat. Very early on the morning of November 3rd, after roll call, all the Jews in Fields III and IV were ordered to form a column and march to the ditches. 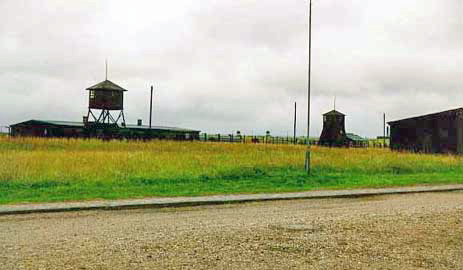 The gravely ill Jews from the three typhus barracks in Field III were dragged out of their bunks and dumped onto trucks for transportation to the ditches. Loudspeakers mounted on trucks had been placed near the ditches, and by the camp gate near the street, to drown out the noise of the machine guns. Simultaneously, a column of over 10,000 Jews were marched toward the gate of Field IV; the first prisoners reached the gate before the end of the column had left the city of Lublin. These victims were from the sub-camps of Majdanek and the work gangs employed outside the camp. The Jewish political prisoners from the Gestapo prison in the Castle in Lublin were also marched to the camp. Around noon, the SS soldiers ordered the Jewish women out of their barracks in Field I, and again the sick were loaded onto trucks, while those able to walk were marched to the ditches. The shooting started around 6 or 7 o’clock in the morning on Nov. 3, 1943, and lasted without a break until 5 p.m., with 100 victims at a time ordered to strip in a nearby barrack and then lie down in the ditches in groups of 10, where they were then machine-gunned to death. Each new group had to lie down on top of the dead bodies from the previous group. The men were shot separately from the women. The barbed wire fence was cut between Field V and the ditches, so that a column of armed policemen could form a passage, along which the victims were funneled into the ditches. This operation was, by no means, done in secret. The Nazis even took photos of the victims, like the one shown below. The shooting was done at the top of the low hill where the Mausoleum now stands and in full view of nearby residents who lived behind the area. The loud dance music which went on for almost 12 hours that day ensured that the local residents knew that something unusual was going on, even if they couldn’t see it. 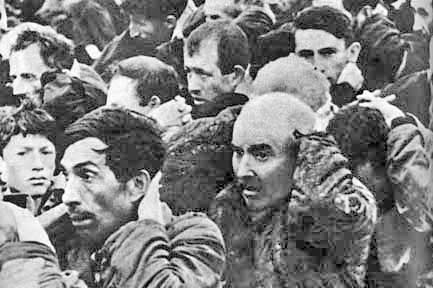 On the same day, there were other mass executions of Jews at the labor camps near the villages of Poniatowa and Trawniki. Just behind the Mausoleum pictured above, and a little to the right, is a small stone which commemorates the deaths of around 18,000 Jews on that spot on November 3, 1943. According to the Museum guidebook, the bodies of the victims of the Harvest Festival massacre at Majdanek were burned, near the ditches, on pyres formed from old truck chassis, and the ashes were thrown onto the compost pile behind the clothing warehouse barracks, which now hold the tourist exhibits. It is these ashes of the massacre victims which have now been given a place of honor in the Mausoleum. Did the Nazis really put the ashes of 18,000 Jews onto a compost pile? When I visited the Majdanek camp in 1998, I looked under the dome of the Mausoleum and to me, the ashes did look just like a compost pile. Heinrich Himmler had a degree in agriculture and he was noted for using organic farming methods; there were compost piles at Dachau, where there was a experimental farm. There was also an experimental farm near Auschwitz. But did the Nazis really use the ashes of the Jews for compost? How do you know when your kidneys are failing? I know that I am a bit late in blogging about Keith Olbermann, who has been in the news lately, but it took me a while to remember why I stopped watching his TV news commentary on MSNBC, and started watching Bill O’Reilly on Fox News instead. On his show on June 1, 2006, Olbermann was outraged as he pointed out that Bill O’Reilly had said that it was U.S. troops that had killed German POWs in the Malmédy massacre during World War II. During an interview with former NATO supreme commander, Wesley Clark, on May 30, 2006, O’Reilly had compared the incident at Malmédy to the alleged killing of 24 Iraqi civilians by U.S. soldiers in Haditha, Iraq. Bill O’Reilly is an educated man; he constantly brags about his degree from Harvard, which irritates me to death. So why would O’Reilly make such a big mistake? Well, he was a bit mixed up about the Malmédy massacre, but not completely wrong in his accusation that Americans had shot German soldiers who had their hands in the air. The infamous Malmédy Massacre occurred, during the Battle of the Bulge, at approximately 1 p.m. on December 17, 1944 and the first survivors of the massacre were picked up at 2:30 p.m. on the same day by a patrol of the American 291st Engineer Battalion. The story of an unprovoked massacre, as told by the survivors, was immediately sent to General Eisenhower, the Supreme Allied Commander of the war in Europe, who made it a point to disseminate the story to the reporters covering the battle. One of the news reporters at the Battle of the Bulge was America’s most famous writer, Ernest Hemingway, who was covering the war for Collier’s magazine. When the gory details of the Malmédy Massacre reached the American people, there was a great outcry for justice to be done. To this day, the Malmédy Massacre is spoken of as one of the worst atrocities perpetrated by the hated Waffen-SS soldiers. The Inspector General of the American First Army learned about the massacre three or four hours after the first survivors were rescued. By late afternoon that day, the news had reached the forward American divisions. It was in the wake of the Malmedy incident at Chegnogne that on New Year’s Day 1945 some 60 German POWs were shot in cold blood by their American guards. The guilt went unpunished. It was felt that the basis for their action was orders that no prisoners were to be taken. O’Reilly was wrong when he said that this war crime happened at Malmédy. It actually happened at Chegnogne, but it happened because of the so-called Malmédy Massacre. You have to give O’Reilly credit for knowing about this obscure bit of history. That’s why I switched from Olbermann to O’Reilly and I never looked back. I have blogged about the Malmédy Massacre case before, but it bears repeating that America adhered to a double standard regarding war crimes committed in World War II. The German soldiers involved in the Malmédy Massacre were prosecuted as war criminals, but there were no charges against the Americans who killed the German POWs. During the proceedings against the Germans who were charged with killing POWs, the defense lawyers were not allowed to mention this. Any of the accused men who inadvertently said anything about American soldiers breaking the rules of the Geneva Convention were promptly silenced and these comments were stricken from the record. In the Malmédy Massacre proceedings, the prosecution case was based on the accusation that Adolf Hitler himself had given the order that no prisoners were to be taken during the Battle of the Bulge and that General Sepp Dietrich had passed down this order to the commanding officers in his Sixth Panzer Army. This meant that there was a Nazi conspiracy to kill American prisoners of war and thus, all of the accused were guilty because they were participants in a “common plan” to break the rules of the Geneva Convention. Yet General Dietrich’s Sixth Panzer Army had taken thousands of other prisoners who were not shot. According to US Army figures, there was a total of 23,554 Americans captured during the Battle of the Bulge. The prosecution claimed that General Sepp Dietrich, on direct orders from Hitler himself, had urged the SS men to remember the German civilians killed by the Allied bombing, and to disregard the rules of warfare that were mandated by the Hague Convention of 1907 and the 1929 Geneva convention. This meant that all of the accused were charged with participating in a conspiracy of evil that came from the highest level, the moral equivalent of the Nazi conspiracy to exterminate all the Jews in Europe, which was one of the charges against the major German war criminals at Nuremberg. An important part of the defense case was based on the fact that the accused men in the Malmédy case were classified as Prisoners of War when they were forced to sign statements incriminating themselves even before they were charged with a war crime. As POWs, they were under the protection of the Geneva Convention of 1929, which prohibited the kind of treatment that the accused claimed they had been subjected to, in order to force them to sign statements of guilt. Article 45 of the Geneva Convention said that Prisoners of War were “subject to the laws, regulations and orders in force in the armies of the detaining powers.” That meant that they were entitled to the same Fifth Amendment rights as American soldiers. During the Malmédy Massacre case, Lt. Col. Rosenfeld (the law member among the prosecutors) ruled against a defense motion to drop the charges, based on this argument; he said that the Malmédy Massacre accused war criminals had never been Prisoners of War because they became war criminals the moment they committed their alleged acts and were thus not entitled to the protection of the Geneva Convention of 1929. During the Malmedy Massacre proceedings, the prosecution claimed that Lt. Col. Jochen Peiper had instructed his men to fight as they had fought against the Russians, disregarding international law about the treatment of prisoners of war. The defendants testified that they had been instructed to take no prisoners, but they understood this to mean that because they were fighting in a tank unit, they were supposed to send POWs to the rear to picked up by infantry units. On Nov. 8, 1938, there was an annual gathering of the Nazi leaders in the Bürgerbräukeller in Munich to remember Hitler’s failed Putsch that had been organized there in 1923. The day before, on Nov. 7, 1938, a young Jew named Herschel Grynszpan had shot Ernst vom Rath, a German diplomat, in Paris. When did Hitler decide on the genocide of the Jews in Europe? Nobody knows because he didn’t put it in writing. One thing we do know is that, in the 1930s, there were proposals, by other European leaders, to resettle the Jews in Uganda, Madagascar or Biro Bidjan in Siberia. In other words, any place besides Palestine. Did Goebbels tell big lies? Does a woodchuck chuck wood? No, I’m not blogging about Geico commercials today. BTW, my favorite Geico commercial is this one: “Is a bird in the hand worth two in the bush?” It cracks me up every time. But I digress. Last night, Steve Cohen, a Democratic Congressman from Tennessee, invoked the Holocaust to attack Republicans on the Health Care bill; he compared Republican arguments to “the big lies” told by Germany’s Propaganda Minister, Josef Goebbels, in the World War II era.